Trondheim is a city and municipality in the county of Sør-Trøndelag, Norway. The city of Trondheim was established as a municipality January 1, 1838. The rural municipalities of Byneset, Leinstrand, Strinda and Tiller were merged with Trondheim January 1, 1964. The city of Trondheim was founded in 997. Trondheim is today a centre of education, technical and medical research, with around 25,000 students, and is the country's third-largest city, with 162,000 inhabitants in the city proper (January 2007). The Trondheim Region has 246,751 inhabitants. The official web site of Trondheim. 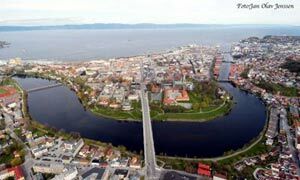 The Virtual Trondheim Norway travel guide with map, hotels, transport, activities, events and shopping guides. Interactive maps and virtual guided tours through Trondheim, personal travel guide. Virtually walk the streets of the inner town!